Since you’re the protectors of one of our most important resources, we thought you’d appreciate this January 2014 story about soil’s contribution to medicine. 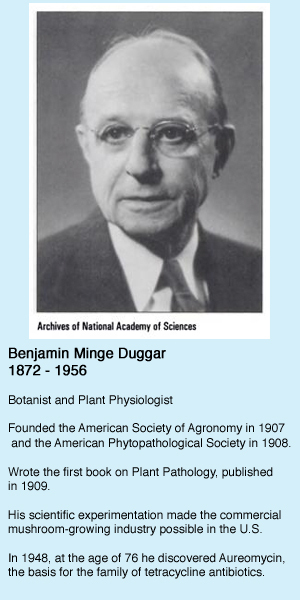 In 1943, after 55 years of research and working in universities, Benjamin Duggar retired at the age of 71. He turned down all the consulting offers that came his way, thinking that he’d enjoy relaxing, catching up on his reading and puttering around at home. But that all changed when he read a short article about his retirement in a popular science journal. “Dr. Duggar will best be remembered for his noteworthy inquiry into the physiology of mushrooms,” it said. Ben didn’t want to be remembered as a mushroom man, and decided to take the offer from Lederle Laboratories to do independent research. Five years, and more than 3500 soil samples later, he’d discovered a new, powerful antibiotic. Duggar told his friend that he had been collecting soil samples from every place he stopped in his travels. He also wrote to his extensive network of colleagues asking them to send soil samples as well. Of the 3500 samples he collected and tested, the one that made the difference came from Dr. William Albrecht, the Chairman of the Department of Soils at the University of Missouri, and the manager of Sanborn Fields. Established in 1888, Sanborn Fields have been continuously managed to study the effects of crop rotation and soil amendments on soil health and crop production. 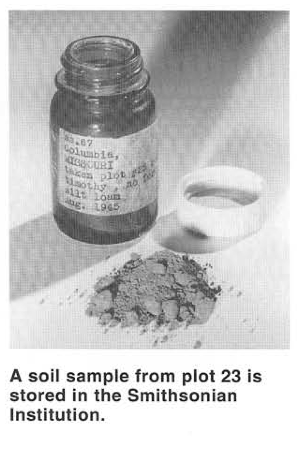 Albrecht sent off a dozen samples, including one from Plot 23, which had been planted with Timothy grass since 1888 and had never received additional nutrients. Aureomycin is the first in the family of antibiotics we commonly call “tetracyclines.” Unlike the penicillins of the time, it did not have to be injected and could be taken orally. By 1948, this new family of antibiotics was in production and being used to cure infections that would have ended in death otherwise. It was particularly effective at quickly reducing high fevers and was the first treatment for the tick spread disease, Rocky Mountain Spotted Fever, that was killing 1 out of 5 people infected with it. So, from one small soil sample, a family of antibiotics was discovered and lives have been saved. But, the gifts that soil keeps giving us have not all been unwrapped. Scientists estimate that a square meter of soil could be home to as many as 1 billion organisms. We may think we are managing pastures and fields for the plants growing in the fields and the animals grazing them. The discovery that it is the soil that gives the farms, and all of us, life, is a present that we are still opening.